Elevating a garden or lawn sprinkler propels the water above tall vegetation. 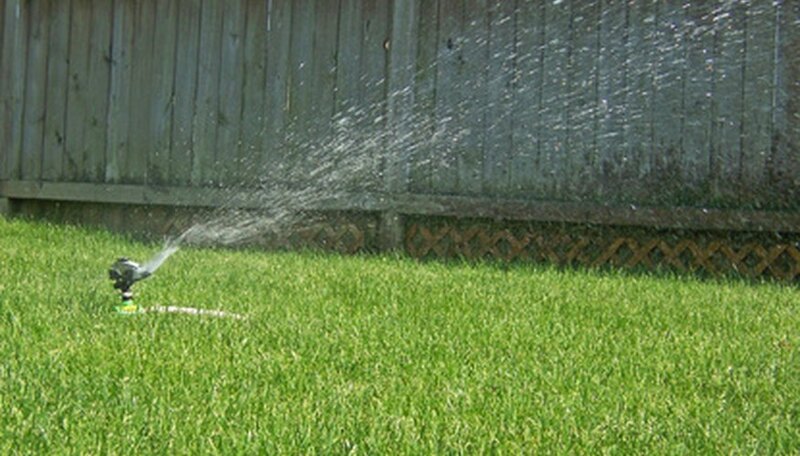 It also eliminates puddles of standing water around the sprinkler since it no longer sits on the ground. Making a wooden stand for the sprinkler is not difficult and takes little time to perform. You can remove the sprinkler stand from the garden when the growing season is finished and store it under cover for next year. Lay the piece of plywood on a flat surface. Set the 2-by-2 so the straight edge is aligned to both diagonal corners of the plywood. Mark a line with the pencil. Move the 2-by-2 to the opposite corners of the plywood. Mark another line. You should have a large “X” on the face of the plywood. Start the wood screw, with the screwdriver, where the two lines meet. Allow the tip of the screw to come through the plywood a 1/4-inch. Fit the sharp tip of the screw to the end of the 2-by-2 in the center. Tighten the screw through the plywood into the end of the 2-by-2. You should now have the piece of plywood attached to the top of the 6-foot-long 2-by-2. Insert the rock bar into the ground where you want to locate the elevated sprinkler stand. Move the rock bar forward and backward while pushing downward. Make a hole 10 to 12 inches deep and wider than the 2-by-2. Remove the rock bar from the hole. Slip the end of the wooden sprinkler stand into the hole. Use your foot to push the soil around the wooden pole. Place the sled type lawn sprinkler on top of the plywood platform. Wrap the rubber bungee cord around the base of the lawn sprinkler and under the plywood platform. Secure the two end hooks on the bungee cord together. The sprinkler should now be secure to the platform. Attach the garden hose to the sprinkler and outdoor water spigot. Turn the water on. If the wooden platform becomes loose in the ground, make the hole deeper with the rock bar. The wooden platform will last for many seasons if it is stored indoors during the winter months. Assemble and install more of the wooden sprinkler strands throughout the garden area. This allows you to water the garden at various times of the day without having to move the sprinkler stand. You can make the sprinkler stand from red cedar. You can keep the stand outside year-round and use the platform for a birdfeeder during the cold winter months.